The Stanley Adventure Stainless Steel Flask is a basic stainless steel flask that's the perfect piece to take tailgating, camping, or just to use when celebrating. It's rugged exterior makes it the perfect accessory. The Stanley Classic Vacuum Pint keeps drinks cold 4.5 hours+ while the exterior remains sweat free. 18/8 stainless steel won't rust and is naturally BPA-free. Press-fit lid helps keep dirt out. This simple, smart Adventure Camp Cookset from Stanley includes a small pot and 2 cups for whipping together quick meals while you're backpacking. 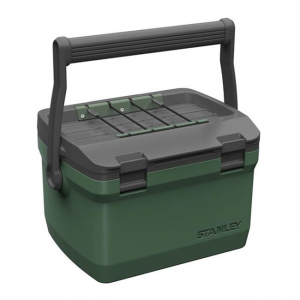 The Stanley Adventure Coolers have double wall foam insulation, keeping contents cold for hours. The leak resistant lid also features a removable dry storage tray and is durable enough to double as a seat. Stanley Adventure Cooler - 16 qt. Headed for your favorite camping spot or a weekend music festival? Keep your food fresh and your drinks icy cold with the Stanley 16 Quart Adventure Cooler. Stanley Adventure Cooler - 30 qt. Headed for your favorite camping spot or out on a road trip? Keep your food fresh and your drinks icy cold with the Stanley 30 qt. Adventure Cooler. Stanley Adventure Cooler - 7 qt. Pack for a picnic in the park or keep post-hike snacks fresh and ready for your return in the 7 qt. Stanley Adventure Cooler. Waking up to hear a percolator bubbling over the campfire is the outdoor coffee many of us remember, and the 6-cup Stanley Adventure Percolator reminds us that Grandpa's way was often best. The Stanley Adventure Prep and Cookset includes a pot, bowls and utensils to bring the ease of indoor cooking to your backcountry campsite. Bring the convenience of your home kitchen to the outdoors with the 19-piece Stanley Adventure Series Base Camp cookset. Everything stows in the 3.7 qt. pot so it's easy to take to your campsite. The Stanley Adventure Series Prep+Eat 9-Piece frying pan set has nearly everything you need to prep a meal and then eat it. Bring your own knife and stove and get cookin'. Stash your camping meals, sides and snacks in the BPA-free Stanley Adventure Series steel canister set. See-through lids keep food visible, and when you're done the 3 canisters nest for easy storage.